In episode 2 of Rediscover the Winds, Kirsten and Zach talk about life, love, and family in Fremont County's past. We share one love story of a big city girl who moved west to teach in a remote town in Wyoming. Then, we look at some tender letters written by a local dad to his twin girls as they went off and sought their fortune far away. ReDiscover the Winds: A Wyoming History Podcast is focused on telling the stories of Wyoming through museum artifacts, expert interviews, and organizational partnerships. The Pioneer Museum in Lander will debut a new temporary exhibit to the public with a reception on February 16th from 4-6pm. The exhibit is a partnership between Healthy Rivers, at Las, Popo Agie Conservation District, Popo Agie Gold, Lander Art Center, Lor Foundation and the Pioneer Museum. The exhibit explores the historic importance of water in this region and its many uses. This exhibit will feature historic photos and artifacts and will also be on exhibit at the Dubois Museum and the Riverton Museum throughout 2019. The Fremont County Museum System is excited to announce the creation of ReDiscover the Winds: A Wyoming History Podcast. The Dubois Museum, Pioneer Museum in Lander and the Riverton Museum have teamed up to bring you the great stories, history and culture of the Wind River Region in a monthly podcast. Each month the Museum's staff will bring you different aspects of the regions history. The podcast will be available on itunes, utube, soundcloud and the Fremont County Museums website. Be sure to like Rediscover the Winds: A Wyoming History Podcast on facebook. 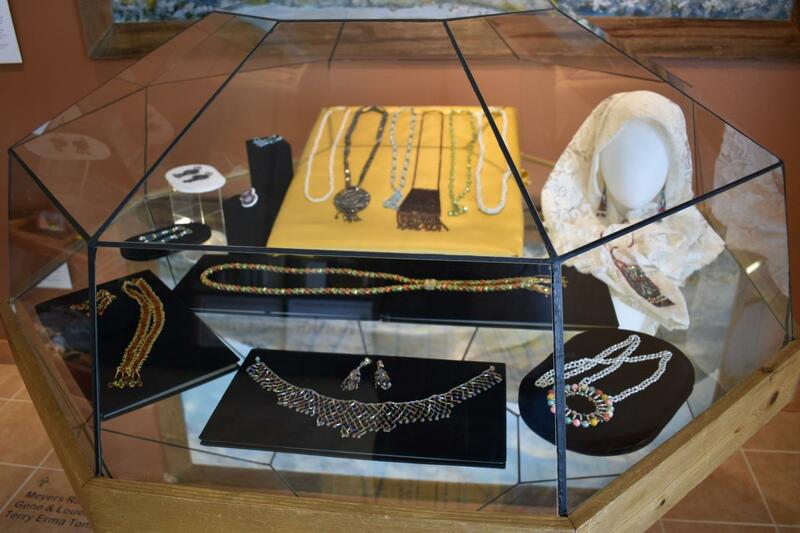 The Lander Pioneer Museum just opened a new jewelry display in the museum lobby. Mattie Ellan Darlington was a Lander woman who ran a local beauty shop and was a prolific jewelry maker. Dozens of her original handmade necklaces, ear rings, pins, bracelets and other pieces are on exhibit through the spring. This collection by Mattie Ellan Darlington represents her personal cultural influences and talents in her art as a beadworker. Born in Byers,Texas, by the 1930s she was in Lander where she married Elmer Darlington. Mattie’s diverse work represents both European and Native American decorative design and reflects the mixed cultural influences she would have grown up with in western North America. 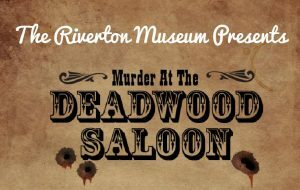 Murder Mystery Night at the Riverton Museum is Back! Want something fun and exciting to do during the cold days of February, or better yet to take your sweetheart out on an evening of mystery and murder the week before Valentine’s Day? The Riverton Museum will be hosting their second annual Night of Mystery event this coming February 9th. Join in on a fun evening solving the murder of one of the characters during the event. “We are very excited to be hosting a second Night of Mystery at the Riverton Museum. Our first event in 2018 was such a hit that we had several requests for another party and this year we have chosen Totally Rad 80s Prom – Gone Bad for this year’s theme. So pull out that bottle of aqua–net and tease your hair for this fun evening! All proceeds go to benefit the Riverton Museum to support our educational programs” stated Karline Stetler, Site Director for the Riverton Museum. Tickets/character packets can be purchased at the Riverton Museum at 700 East Park Avenue, Monday through Saturday, 9am-5pm. There is a limited about of tickets so get yours before they sell out! We hope to see you on February 9th. Call the Riverton Museum for details at 307-856-2665. Ticket include food and beverages during the event. Cooler weather brings leaves that accumulate on the lawn, and create large piles. It makes you want to jump in like we did as children, hoping that there’s no surprises left from a pup or critter. Everyone in town is racing to get the leaves raked up before the winter weather brings in snow to cover the lawns until the spring. The Riverton Museum is no exception. Each year, leaves on the museum’s property need to be raked and taken to the Riverton Bale Station. This year, the Museum received well-welcomed help with their vast collection of leaves from Simply Support – a program designed for adults with developmental disabilities and acquired brain injuries. Simply Support visited the museum earlier in the fall. They learned more about the history of Riverton and the surrounding communities. Following a Seek n’ Find activity, staff with Simply Support inquired about volunteer opportunities for their participants. Cleaning up the leaves came to mind. “We were so appreciative that the participants at Simply Support wanted to help us with our seasonal yard work. With a small number of staff on hand and with so many projects on our plate, it is sometimes difficult to get this task done. 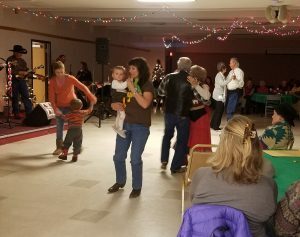 Simply Support was generous enough to come in and help the Riverton Museum out,” stated Karline Stetler, the Museum’s site director. 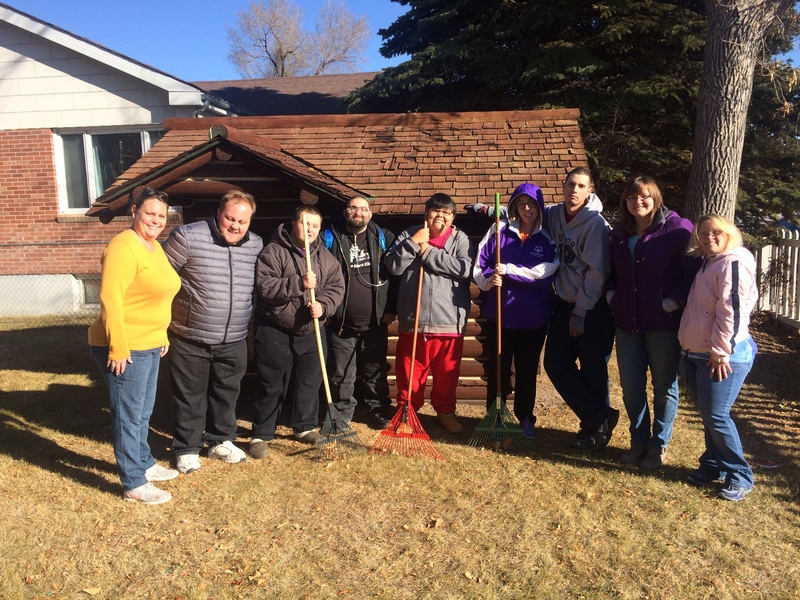 The whole group – Simply Support and Riverton Museum staff – worked together to prepare the lawn for winter. Thanks to the help of Simply Support, the leaves were raked up in just under an hour! Amazing work! The Riverton Museum would like to send out thanks to all past and present community groups and individuals that have volunteered at the Riverton Museum to help out with a variety of projects. Thank You! The Riverton Museum has happy to announce the hiring of the new Collections Manager. Zach Larsen comes to the Riverton Museum from the LDS Church History Museum in Salt Lake City. Zach has a B.A. History from Brigham Young University-Idaho and is currently finishing his M.A. History at the Utah State University. Zach grew up in Fremont County, where he cultivated an interest in Wyoming's history of petroleum, mining and energy production. He is currently researching and writing about Fremont County's Uranium indostry and the towns that it supported. Zach says, "The Riverton Museum offered me a rare chance to work both in my chosen field, and in my area of expertise! 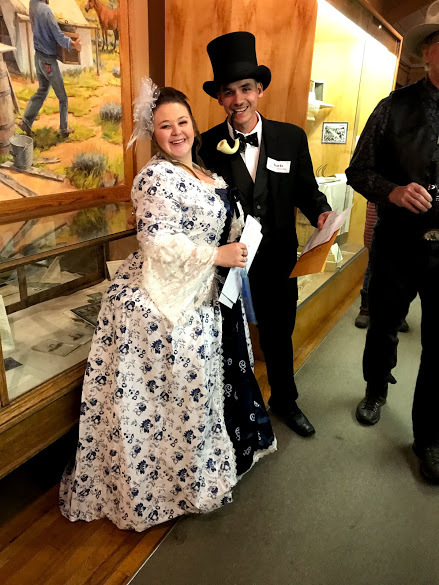 I am very happy to be part of the Fremont County Museum team!" Zach loves spending time with his wife and their two little boys. He also enjoys photography, relaoding, and shooting, and tinkering with old computers. 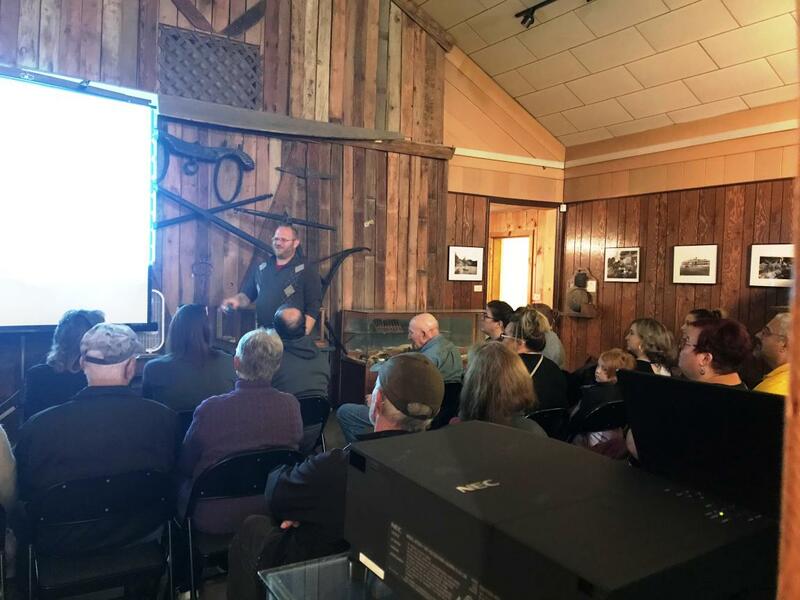 It was a full house at the Riverton Museum on Saturday, October 6th for one of their Discovery Speaker Series, sponsored through Wyoming Community Bank. For the month of October the program focused on ghost stories, urban myths, and legends of the Riverton and Fremont County area. Alma Law, who is an English teacher at the Riverton High School, was the presenter for the afternoon where he spoke on his research on the various ghost stories from the area. Using photos via PowerPoint to help guide the presentation, Mr. Law regaled the audience with a number of haunting tales from around the area. 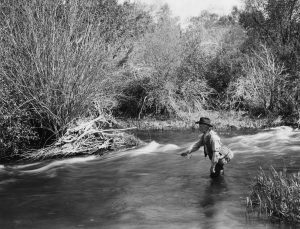 A traveling exhibit from the Wyoming State Museum is on display at the Riverton Museum that examines the work of photographer Joseph E. Stimson, who captured the beauty of Wyoming in the early 1900s. Stimson was noted throughout the United States for his artistic skills with a camera and his hand-colored photographs. Coming from humble beginnings in Virginia where he was born and raised Stimson soon joined two of his brothers in Cheyenne and started up a photography business there taking portraits. He was later asked to join the Union Pacific as their photographer. “I am really interested in this exhibit from the Wyoming State Museum. Joseph Stimson was given the opportunity to take photographs for the Union Pacific railroad as a publicity photographer which provided him the chance to travel across the state of Wyoming photographing various areas. The photographs on display are full of life and you can spend a good few minutes looking over each photograph because they are filled with so much detail” stated Karline Stetler, site director for the Riverton Museum. Joseph Stimson’s career as a photographer spanned 59 years and he produced more than 7,500 images most of which reside in the Wyoming State Archives. 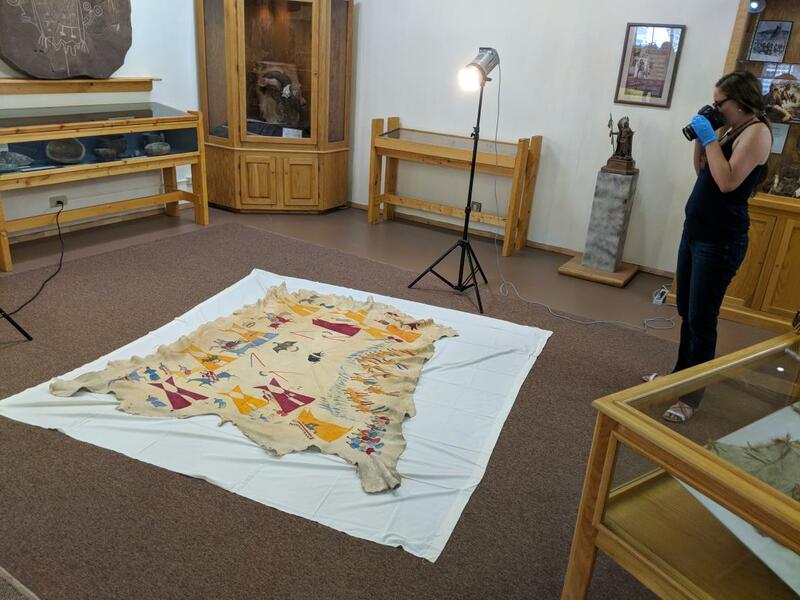 The traveling exhibit on display at the Riverton Museum will run from the first of September into the second week of October where it will be packed up and returned to the Wyoming State Museum. Stop by the Riverton Museum at 700 E Part Ave to take a look at this wonderful collection and enjoy more of Riverton's great cultural heritage. Beginning in 2013, University of Wisconsin-Madison's Geology Museum researcher Dr. David Lovelace began exploring the classic red rocks of the Triassic aged (~252-201 mya) Chugwater Group that are well exposed along the eastern flank of the Wind River mountains. These outcrops stretch from south of Lander all the way up to Dubois. The Late Triassic Popo Agie Formation is the uppermost unit of the Chugwater Group and is thought to be around 230-225 million years old. This formation is named after the Popo Agie River near Lander and it preserves extraordinary fossils that represent an ancient terrestrial ecosystem that thrived during the dawn of the dinosaurs. Lovelace, along with UWGM students have discovered a number of new specimens on both private and public lands throughout the region. Most of the fossils are still being extracted from the rock that has preserved them all this time. 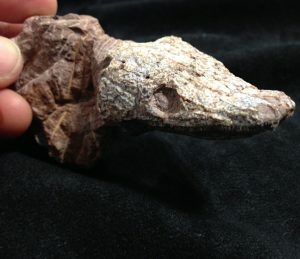 A new skull of a phytosaur - an ancient crocodile-like animal - was found on private land near Lander in 2013; it has been more than half of a century since the last phytosaur discovery in the state! In 2014-2015 two sites were discovered near Dubois on public lands held in trust by the Bureau of Land Management. During the 2016 field season excavation was started and continued again this summer. Both of these sites preserve a mass-death assemblage of ancient temnospondyl amphibians that are most closely related to caecilians, a group of modern legless amphibians. The first site (known as Nobby Knob) has dozens of partially articulated skeletons of giant temnospondyls called Koskinonodon; these animals roughly resemble 6 foot long giant salamanders! The second site (known as Serendipity) preserves hundreds of burrows about the diameter and shape of a Pringles can, many of which preserve articulated skeletons of a new tiny temnospondyl species. 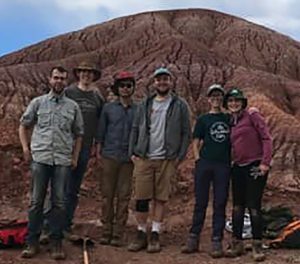 This year the UW-Madison crew, led by Ph.D. student Aaron Kufner and Calvin So, are spending nearly 2 months documenting and excavating the Nobby Knob and Serendipity sites. Eventually the material that is being collected will be prepared and studied at the UWGM, and will be highlighted in the museum's gallery. It will take years to complete the preparation (it takes about 12-15 person-hours of lab work for every person-hour in the field). Future collaborations with the Fremont County Museums are being developed, so stay tuned! The Fremont County Museums are sharing artifacts in a project to help understand and communicate the role of Elk on the Wind River Reservation. The project, run by the High Plains American Indian Research Institute, the Wyoming Humanities Council and Wyoming School districts #14 and #21 is examining the role that Elk have in the culture of Native American people. Tribal members will play a lead role in incorporating the information into schools and communities on the Wind River Indian Reservation, and the work will help serve as a model to incorporate Native American curriculum throughout Wyoming schools as envisioned by the recent Indian Education for All legislation. 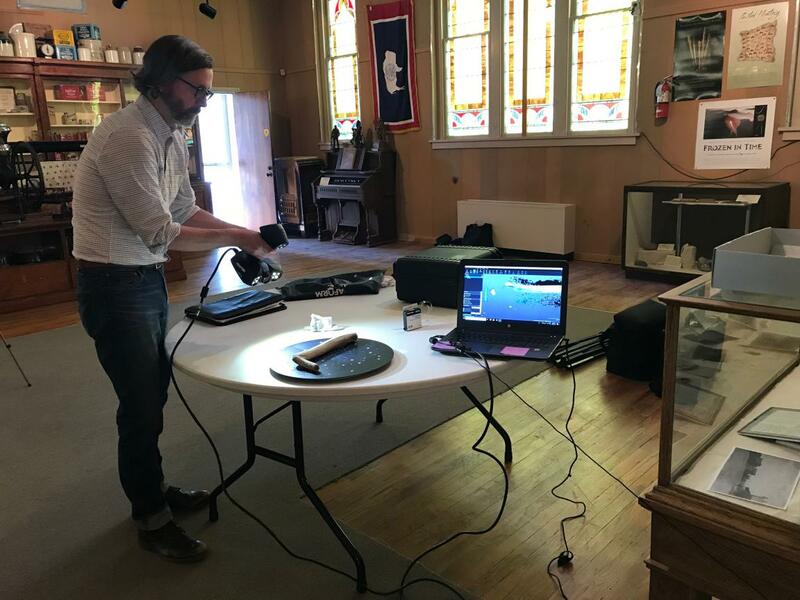 They visited all three Fremont County Museums (Dubois Museum, Pioneer Museum in Lander, Riverton Museum) this week to examine and do high resolution 3D scans of a variety of artifacts made of elk hide, bone and teeth. 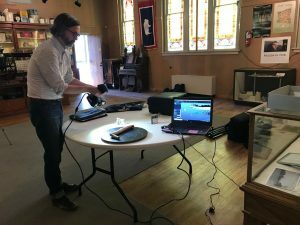 At the Lander museum a team used state of the art equipment to scan and record Elk hide gauntlets, necklaces made from Elk ivory and other items. The Riverton Museum has two artifacts that were part of the project, an elk antler hide scraper, and a hide purse made out of elk skin. The Dubois Museum participated in the project with a painted elk hide and a beaded elk hide jacket. The photographs and video recorded will be added to the Elk Culture Collection in the care of the High Plains American Indian Research Institute and will be available to everyone. The project has received financial support from the National Endowment for the Humanities (NEH) to the University of Wyoming. Private fundraising is underway for UW to match the $150,000 NEH award. Born in Wisconsin raised and educated in Northern Minnesota I moved to Montana where I ran a small business selling agricultural equipment. There I gained a respect for ag and small business and a love of the Northern Rocky Mountain Region. Thirty six years ago I came to Fremont County with my degree in finance and economics and began my career as a financial advisor. I still enjoy my job, the people I serve and this community. Fremont county and Riverton in particular has been a good place to live and raise my four children who have grown to become fine productive young adults. My motivation to be on the County Museum Board is twofold. One, I enjoy history, the stories of how we came to be the community we are is fascinating to me and stories that I think should be shared with anyone willing to listen. If we can learn to tell those stories to more people in a more effective and interesting way our museums become a more valuable asset to our county. Secondly, I am concerned for the future of our Fremont County communities. With the advent of internet commerce our towns become less important as retail centers. So what then do we become? One of the answers I think is that we become social and cultural centers. That is where museums come in. Museums are not just valuable sources of education but also a reason to come to town and a reason to get together. I hope that my experience gained on numerous community boards and organizations will help make that happen. Contact the Riverton Museum at 307-956-2665 to apply. The Riverton Museum in Riverton, WY seeks an energetic professional to manage the collections for one of Fremont County’s three Museums. This individual will work collaboratively with other museum staff and other museum professionals within the Fremont County Museum System. Oversee all aspects of collection management including planning, care, loan requests, conservation, accessions, storage, research, exhibits etc. Assist with educational initiatives for various Museum audiences which may include developing and leading public curatorial and gallery talks, meeting with classes and other written materials for various audiences. Candidate must possess effective oral and written communication skills and the ability to effectively manage multiple staff and volunteers. $27,700/year plus very competitive benefit package that includes excellent retirement, health insurance, 10 paid holidays per year, sick leave and vacation leave. The Fremont County Museum Board will hold its monthly meeting Juyly 12th at the Dubois Museum. The work session will be at noon and the regular meeting will begin a 1pm. The area known as “Dubois” today acts a main crossroads for all of life, and the Dubois Museum tells the “crossroads” story through several new exhibits. 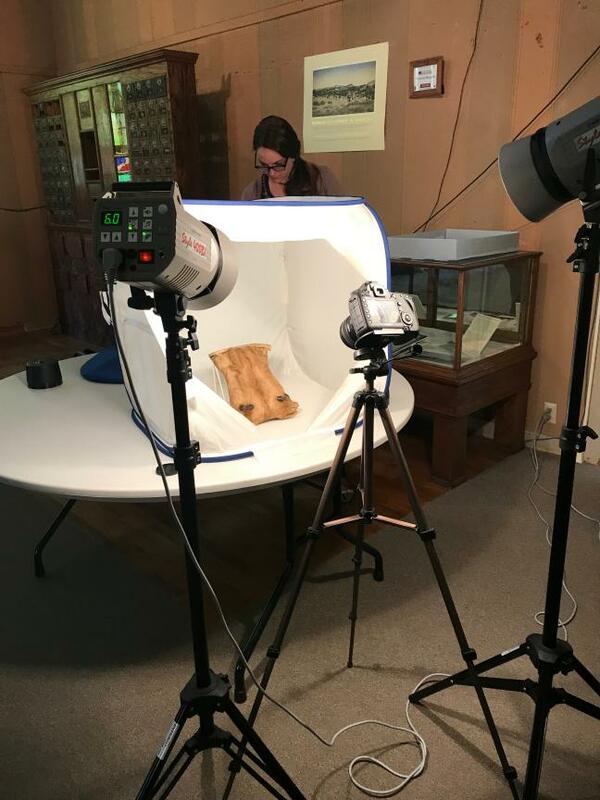 “The addition of artifacts from the James D. and Iva Mae Stewart Collection, most notably the firearms collection, has made it possible for us to tell a better story about the crossroads that is now Dubois.” says Johanna Thompson, Site Director. 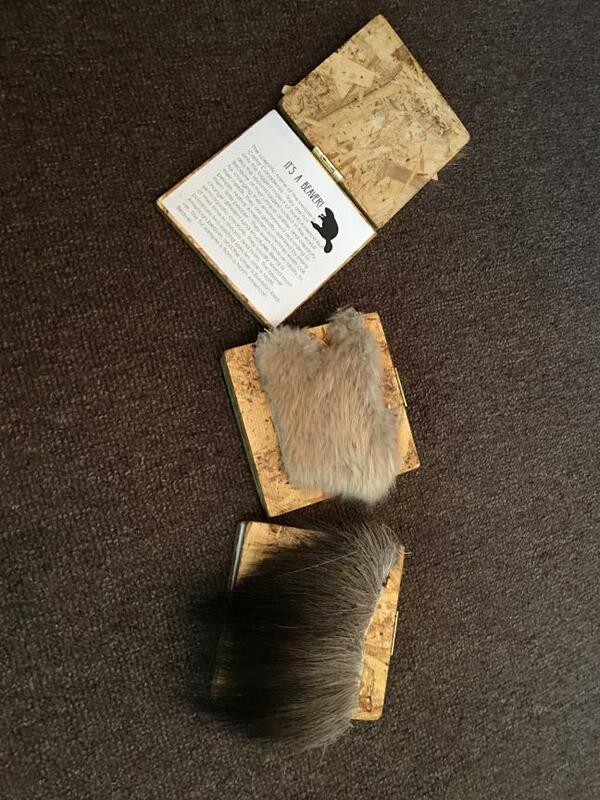 “Crossroads 1820s-1840s” talks about the Fur Trade era. Items on display include two authentic beaver fur hats, a Russian model 1819 musket from the James D. and Iva Mae Stewart Collection, and several other mountain man artifacts. There is also a painting depicting life of the Fur Trade by the local artist John Phelps. Buffalo are the center of attention in the Museum’s “Crossroads 1840s-1880s” exhibit. Displayed alongside a buffalo hide coat is an 1874 Sharps Rifle. Also called a “Buffalo Gun,” this firearm could have certainly killed buffalo, but it is not likely the hunting of huge numbers of buffalo actually happened in the Dubois area. Still the demand for buffalo hides and the extensive trade routes that existed found their way to and through Dubois. Many historical institutions in the United States celebrated the 100th anniversary of World War I, including the Dubois Museum. “Crossroads 1914-1918” illustrates the different activities people did on the Home Front. From practicing food conservation to holding book drives, the people of Wyoming did their part. A Red Cross veil, part of the CM Ranch Collection, and WWI sheet music, including a piece written and published in Dubois by the Clendening Music Co., create a diverse image of the home front for visitors to view. The Museum’s newest exhibit reflects on the day an Army B24 Liberator bomber entered the crossroads of Dubois and never left. “Crossroads August 14, 1943” has a great deal of information about the history of the crew and aircraft of the ill-fated flight. One of the .50 caliber machine guns recovered from the sight along with the records of eyewitnesses who saw the large bomber before it crashed is on display. This year marks 75 years since the crash that changed the name of Henton Basin to Bomber Basin. Explore these new exhibits and relive some older ones this summer at the Dubois Museum! There is a great article on Carrentals.com that features the Centennial Scenic Byway in Wyoming (Wyoming Highway 26 over Towagatee Pass). Check it out. The Riverton Museum is extremely grateful to Tom Woodyard for his bequest to the Riverton Museum this past year. The positive impact of Mr. Woodyard's extremely generous gift on the Riverton Museum cannot be understated. It is so important for productivity and the sustainability of the museum to receive these kind of gifts. The Woodyard family provide the following information about Mr. Woodyard so members of the community would have a better sense of who he was. Many thanks to Mr. Woodyard and his family for their support and caring for the Riverton Museum. "Tom Woodyard came to Riverton in 1958 as a 6th grade teacher. He enjoyed the people, lifestyle, and cool weather and was able to remain in his home until his death in October 2016. He was a native of Coles County, Illinois and maintained close ties to his family and friends there. Immediately after receiving his Masters degree from the University of Illinois, he was drafted and served proudly in the Army during the Korean War. He spent three years in Northern Arizona as a teacher and as a Seasonal Ranger at the Grand Canyon. His Riverton teaching career spanned about twenty-five years and influenced many young people. 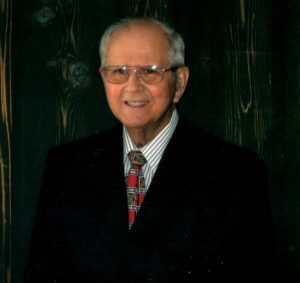 He was an active member of the United Methodist Church and enjoyed other community activities. 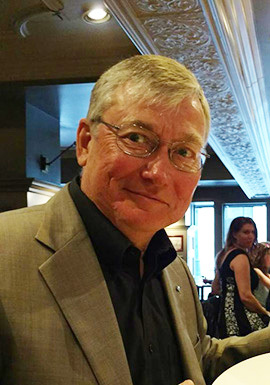 As family historian and genealogy researcher, he wrote and published two family books. He enjoyed traveling and was a lifelong learner with many interests. With his numerous charitable bequests his legacy continues." The staff at the Riverton Museum is proud to announce the grand opening of their new Hands on History room for children. This room is designed with younger children in mind (suggested ages range from 2 years to 3rd grade), however anyone is welcome to come in and enjoy what the room has to offer. 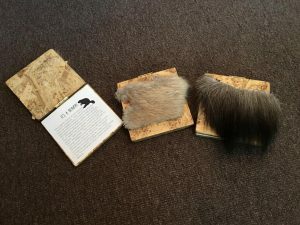 Displays such as “Who’s Fur is This?” feature hands on interactive and educational items where kids are not only welcome to touch but encouraged to. The room will open with at least 4 interactive activities with more slated to come within the following months/years. The room will have some permanent exhibits with the rest being flexible and able to change as time goes by. The opening exhibits will include a Weaving Loom, a 1950s typewriter, a touch and feel station for kids to feel animal furs, and a history road map with interactive magnates. There will also be coloring pages and books available for the smaller children to play with while their older siblings learn and play with the other exhibits. The opening day for this new room will be Friday, June 1st. Free admittance to the museum will be available all day from 9am-5pm for families with children. As part of the grand opening from 1pm-2pm the Riverton Librarians will be having a special craft in the basement of the museum. 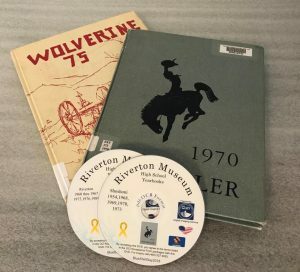 Fremont County residents can now take a walk down memory lane, browsing through Riverton High School and Shoshoni High School yearbooks via PDF format on a DVD. Several years of Riverton and Shoshoni school annuals were digitized by the Oklahoma Correctional Institution (OCI) at no cost. The annuals were sent out, digitized and later returned with a DVD copy. 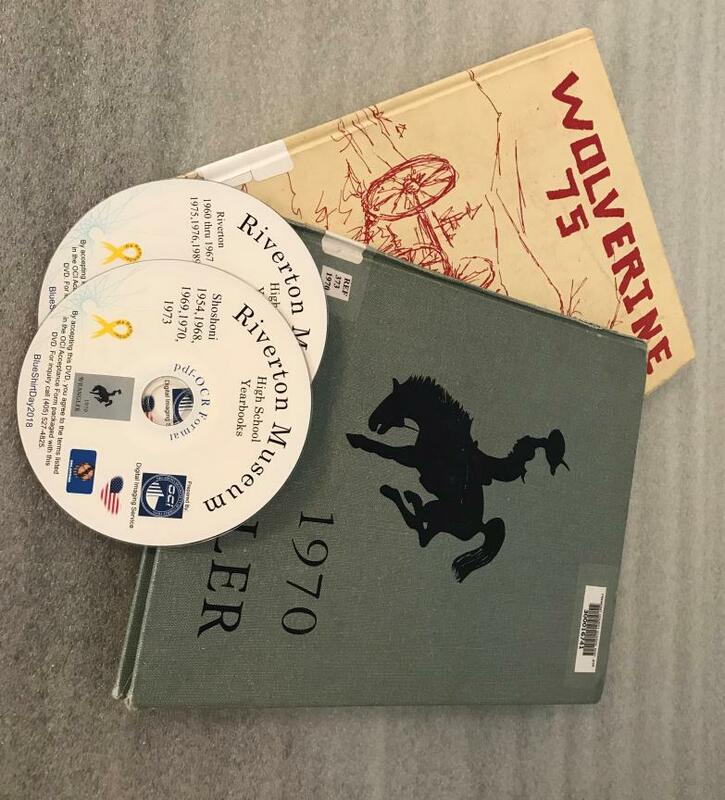 The yearbooks digitized so far from Riverton are the years 1960 thru 1967, 1975, 1976, and 1989. Shoshoni annuals digitized were 1954, 1968 thru 1970 and 1973. “When we get more annuals in to help fill in those missing years we will send them out to OCI to be digitize which will help further preserve our history,” said Karline Stetler. If anyone would like to contribute to this project and help the Riverton Museum with the missing years they can contact the museum at 307-856-2665 or stop in at 700 East Park Avenue. The DVDs are available for browsing at the Riverton Museum, Monday thru Saturday, 9:00 AM thru 5:00 PM. George Yarbarough was raised in the Brooks Lake, Dunior Valley, Crowheart and Dubois areas. He currently is a volunteer docent at the Pioneer Museum in Douglas, Wyoming. The Johnson County War and the Wild Bunch are among the top questions that George receives at the museum. The Johnson County War was an attempt by the then ruling class of individuals to stop the newcomers or settlers from changing the game by maintaining the status quo, to freeze time in 1892. Similar examples include Crazy Horse and Sitting Bull trying to halt change in the 1870s, Red Cloud in the 1860s and prior to those times, the Crow tribe resisting the advance of the Sioux and their allies in the early 1800s. By the late 1800s, might was right: the law of the land was the golden rule, he who has the gold...rules. 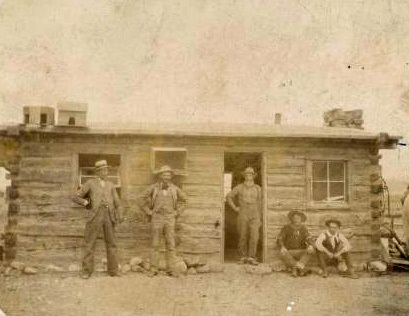 The once all powerful, absentee, overseas owners of the large, public-land-based livestock operations had been wiped-out by the dry summer of 1886, followed by the hard winter of 1886-1887; only to be replaced by their ex-employees who, knowing an opportunity, were not going to accept new neighbors or homesteaders without a fight. The new arrivals were in direct competition for the limited natural resources, a bloody conflict resulted with many unrecorded atrocities committed by both sides, and desperate people do desperate deeds. When did the Johnson County War end? George thinks it is still occurring...just with lawyers not guns. The Wild Bunch was a group of loosely organized, well-mounted outlaws that operated mainly in the Rocky Mountain region. The gang could not have moved around the rough terrain so easy without help from the locals, much like Robin Hood. One man’s terrorist is another man’s freedom fighter. Good men can do bad things and bad men can do good things. Did the Johnson County War influence the bandits and their friends? Without a doubt! Please come share your stories and learn some history with George and everyone else on Saturday, May 19 at 7pm, at the Dennison Lodge. For more information contact the Dubois Museum, 909 West Ramshorn, 307-455-2284 or by email at duboismuseum@gmail.com. Explore future Dubois Museum events including Wednesday, June 6th, “Create Your Own Fossil”, with Tate Geological Museum. Back of the photo says, “Post Office for Dubois about 1894. Gene Amoretti, Hughey Youman, Lasso Bill?, Butch Cassidy”. The photo also says it belongs to Frankie Moriarty. A new documentary about five New Deal era muralists is complete and ready for viewing. “Wyoming Art Matters: The New Deal Artist Public Art Legacy” features stories about Eugene Kingman, Manuel Bromberg, George Vandersluis, Louise Emerson Ronne­beck and Verona Burkhard. A screening is set for Thursday June 7th at the Riverton Museum. This year marks the 85th anniversary of the New Deal. 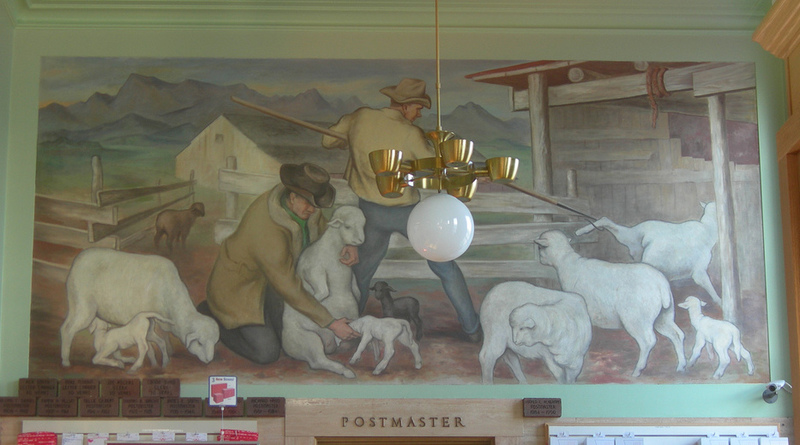 The mural in Riverton by George Vander Sluis is entitled “Farm Scene". It was completed in 1942," according the Riverton Museum Site Director Karline Stetler, who is also featured in the documentary. Also at the screening will be Northern Arapaho muralist Robert Martinez of Riverton. In February 1942, the New Deal Treasury Section of the Arts invited George Vander Sluis of Colorado Springs to submit designs for a mural that would go in Riverton. 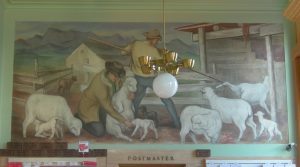 The 13×6 foot painting, completed some eight months later, was the last Treasury Section job done in Wyoming. Vander Sluis was picked for the $850.00 Riverton assignment on the basis of an entry he had submitted for a Denver mural competition. By this time, the country was involved in World War II and complicated the Riverton commission in two ways. The artist was pressed to complete his work before military induction and the Section itself was unsure of its mission, in the new wartime setting. Each installed mural, in five Wyoming communities - Kemmerer, Riverton, Powell, Greybull and Worland (relocated to Casper, Wyoming). O’Hashi interviewed relatives or individuals who knew the artists. “I wanted to get insight into the life of the artist, rather than just historical facts. I was able to catch up with Denver art dealer Norm Anderson who handled many of the Colorado works of George Vander Sluis." 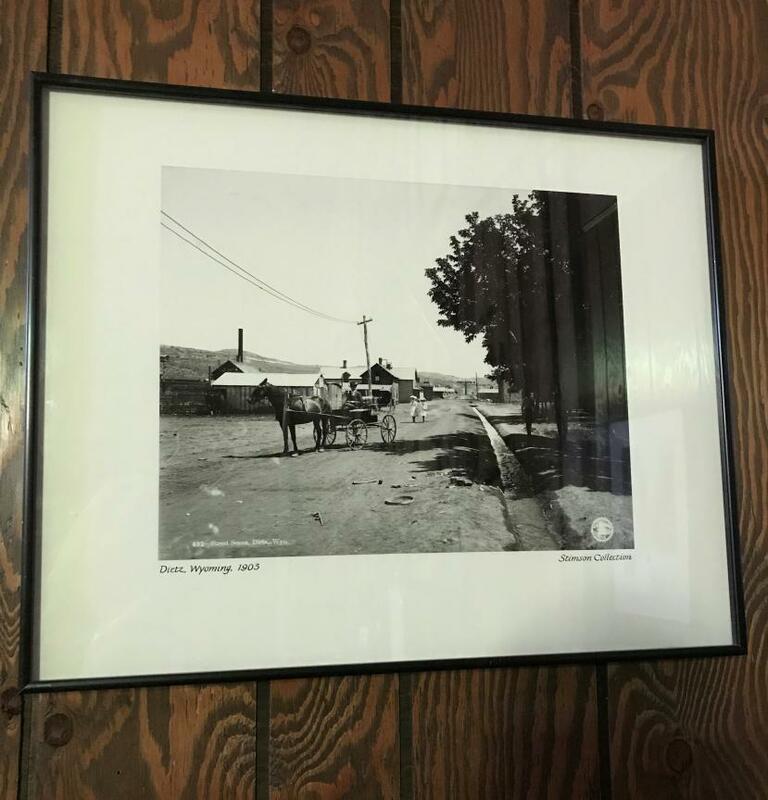 The project funded by the Wyoming Arts Council, the Wyoming Cultural Trust and the Wyoming Humanities Council was completed in time to commemorate the 85th anniver­sary of the New Deal. For information about screenings contact the Riverton Museum at 307-856-2665. The staff at the Riverton Museum recently installed their 9th temporary exhibit at the Riverton Branch Library. 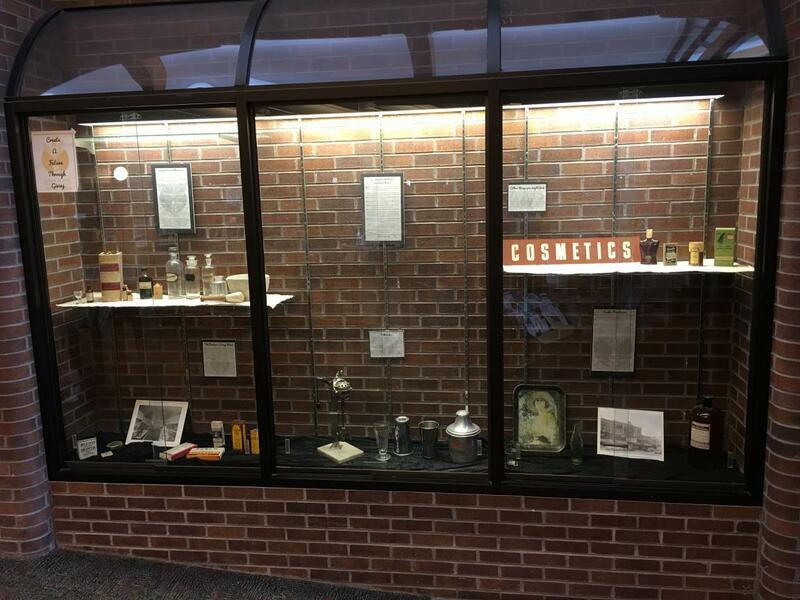 The exhibit features artifacts and photos inspired by the history of pharmacies in America as well as some of the history behind Soda Fountains and Milkshakes in pharmacies and drugstores. The exhibit also touches on one of Riverton’s best known drugstores, the Burlison’s Drugstore. As many residents might remember Burlison’s Drugstore was one of the oldest drugstores in the state of Wyoming and was family owned and operated until it closed in the 60’s. 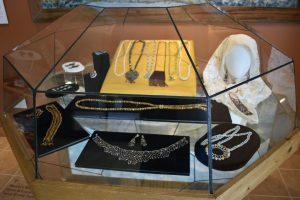 A collection of items from the store is now housed in the Riverton Museum and a few of those items are included in this new exhibit at the library. A pipe is not just an instrument used for smoking; it is as much a form of art and a cultural symbol of friendship, hospitality and peace. A new exhibit at the Lander Pioneer Museum explores historic pipes, many used by Native American people, soldiers and pioneers. The oldest pieces in the exhibit are hundreds of years old, the most recent pipes date from the 1870's. Pipe smoking in North America may go back as far as 3000 years. People who lived in regions where tobacco was a native perennial plant utilized the plant for its narcotic properties. Tobacco was used for leisure, for medicine, as an appetite suppressant, for ceremonial and religious ceremonies. These people traded or gifted tobacco to people from other regions who they encountered. The first European explorer’s to the America’s encountered people who used smoking and tobacco in their cultural practices. These explorers brought tobacco and pipe smoking back to Europe. 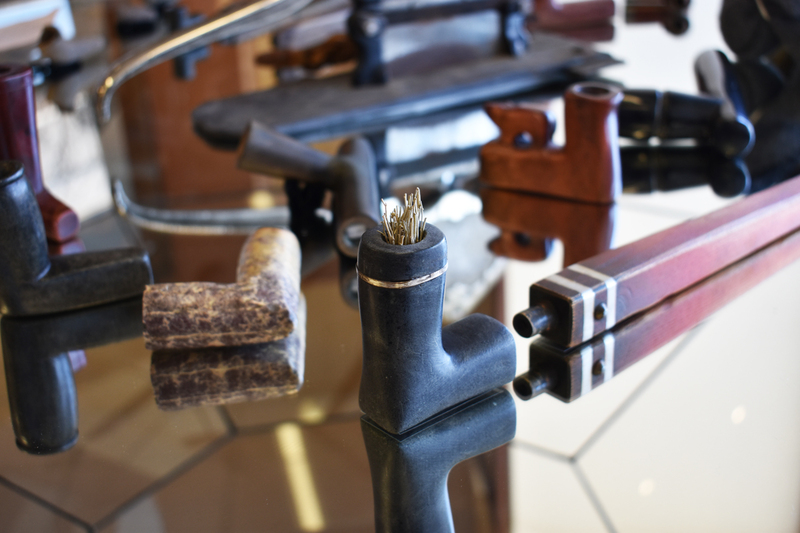 Referred to as ‘tobacco drinking’, by the early 1700's the pipe making and tobacco cultivation industry was developed. Tobacco became a form of currency and pipes were mass produced in both the United States and Europe. Some of the clay pipes on display were made in Ohio and the Carolinas, then brought west by Mountain Men and other traders. Soldiers stationed on the frontier often smoked and would bring pipes with them from the east or buy them at fort sutlers. Several pipes on display were found along the Oregon Trail near South Pass and were likely used by pioneers along the trail, or soldiers that patrolled the trail. A traditional twist or plug of tobacco is on exhibit. It was easier to store and transport the plant that way in the early days of Westward expansion. Tobacco was an important trade good between tribes, and between white merchants and Native Americans as well as settlers. On display are a large number of Native American pipes, many from this area. Native people smoked tobacco (often traded over long distances from other tribal groups), and other native plants depending on the ceremony. The exhibit shows a wide variety of Native American pipe materials, from catlinite, a reddish stone, to clay, steatite (a soft easily carved stone) or metal. Chief Washakie, leader of the Shoshone people holding a ceremonial pipe. Boney Earnest (with pipe) and his wife Mattie who ranched along the Sweetwater River. Part of the new pipe exhibit at the Pioneer Museum in Lander. 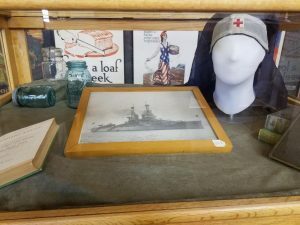 Dubois, Wyoming - Fort Caspar Museum has organized an exhibit of World War I-era posters to commemorate the 100th anniversary of the U.S. entry into that global conflict. The posters were created for a domestic audience and depict activities Americans were encouraged to undertake stateside to support the war effort overseas. "Home Front Posters of the Great War, 1917-1918" consists of thirty framed copies of posters in the collection of the National World War I Museum and Memorial in Kansas City and will be on view at the Dubois Museum now through April 21st. “Uncle Samuel’s Sons are on Their Way” by HM Clendening and produced by Clendening Music Co. Dubois, WY in 1918, sheet music is on display along with others. For an extra treat, visitors can sample audio clips of the sheet music on an interactive tablet. The tablet also has a speech by James Watson Gerard, American Ambassador to Germany during World War I. The exhibit also highlights the USS Wyoming and the important role that books played on this magnificent battle ship. During WWI everyone got involved in the fight, and on the home front certain food items were limited if they could not be totally removed from daily life. The Red Cross was becoming the organization that we know today and on display is a period appropriate Red Cross uniform veil. After the exhibit closes in Dubois, the exhibit will continue to travel around Wyoming and the next stop will be Powell. Communities in our state that will or have hosted the posters to display are Wheatland, Cheyenne, Laramie, Green River, Pinedale, Evanston, Alpine, Dubois, Powell, Riverton, Sheridan, and Gillette. 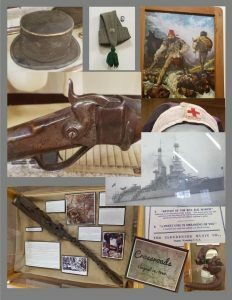 The exhibit is sponsored by Wells Fargo Bank, the Fort Caspar Museum Association, and the Casper Memorial VFW Post 9439 & Auxiliary. In 1940 the Lander High School (then known as the Fremont County Vocational High School) Social Studies classes put together a lengthy report on life in Lander in the late 1930s and 1940. 150 students participated, interviewing old timers, business leaders and others. The purpose of the report was “to develop an interest in local history and an understanding of local problems and agencies and to place the information where it might be readily accessible. The book length report is a fascinating snapshot of Lander at that time, showing many differences from life in the town today. Two chapters in the book detail barber and beauty shops in the community. Jim Trimmer wrote his report on barber shops. He reported that there were five barber shops in Lander (there is only one today) in 1940, employing eight people. Barbers did haircuts, shaves, shampoos, neck trims and massages, and made $100 to $150 a month. One of the purposes of the project was to learn about jobs, how to get them and what training it took. 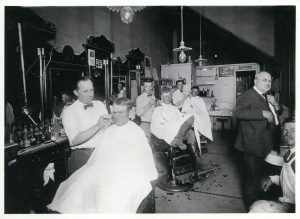 Trimmer reported that a training course for barbers lasted six months and cost $100 for tuition, opportunity for advancement was limited unless you opened your own shop, and that barbers worked long hours. Ruth Ansell and Betty Newinger wrote their chapter on Lander Beauty parlors. There were seven in Lander in 1940, two in private homes and the others on or near Main Street. They included Bett’s Beauty Shop, Fremont Beauty Shop, Yocum’s Beauty Shop, Dolorese’s Beauty Shop and Mary Janes Beauty Shop. There were two employees in each shop, except for the ones in people’s homes, and operators had to train for nine months and pass a state of Wyoming test before they could open a shop. The price for permanents was $2.50 to $6.00. The more expensive permanent was machineless. In 1940 there were two dry cleaning shops in Lander and one laundry, employing 19 people. Ironers got $10 to $12 a week, while pressers earned $16 a week, the delivery man $17 a week and washers $20 a week. 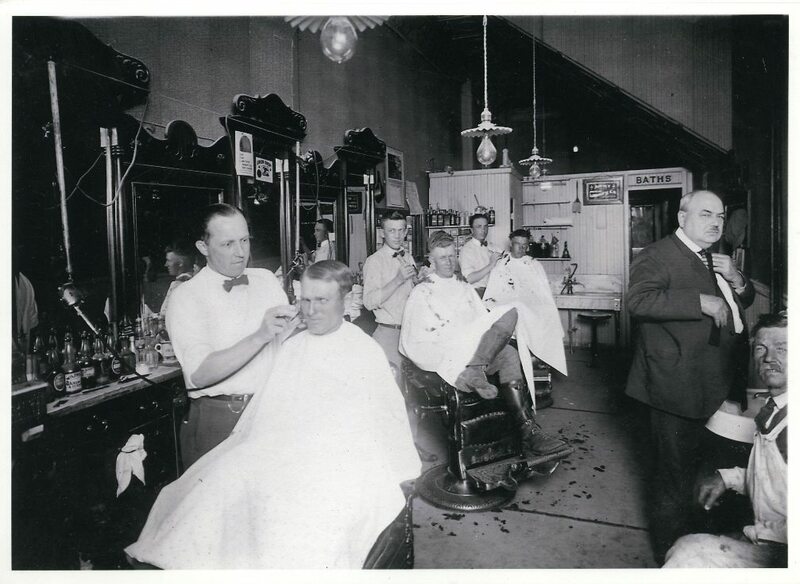 photo: The interior of Trimmers Barber shop around 1940. The regular meeting of the Fremont County Museum Board is postponed due to lack of quorum until March 15th with the work session at noon and the meeting at 1:00 at the Riverton Museum. Sorry for the inconvenience. Over the years dozens of small businesses made Lander’s Main Street their home. 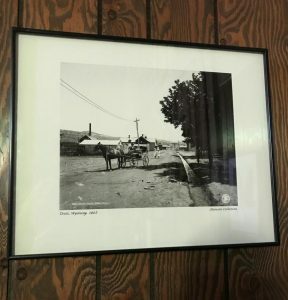 The Lander Pioneer Museum recently received a donation of photographs, ledgers, a safe, meat cutting tools and more from Bille’s Market. 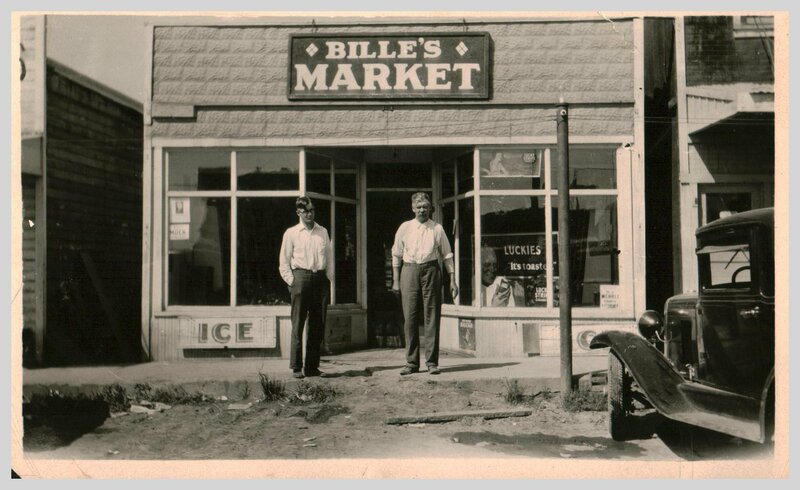 Located in the 200 block of South Main, Bille’s market sold a little of everything. It was a butcher shop, sold tinned food and oil. According to people that still remember him, Hans Bille had a kind heart and extended credit to people that needed it, especially during the Depression. Many of these customers were then unable to pay, which caused the Market to struggle financially. He also gave credit and did business with Native Americans, when many other Lander businesses wouldn’t at that time. 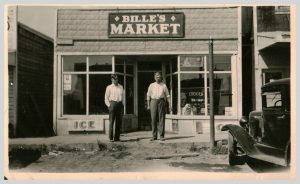 Bille’s Market operated until 1956 when it had to close. Some of the items from Bille’s Market are on display at the museum in a lobby display through the spring. 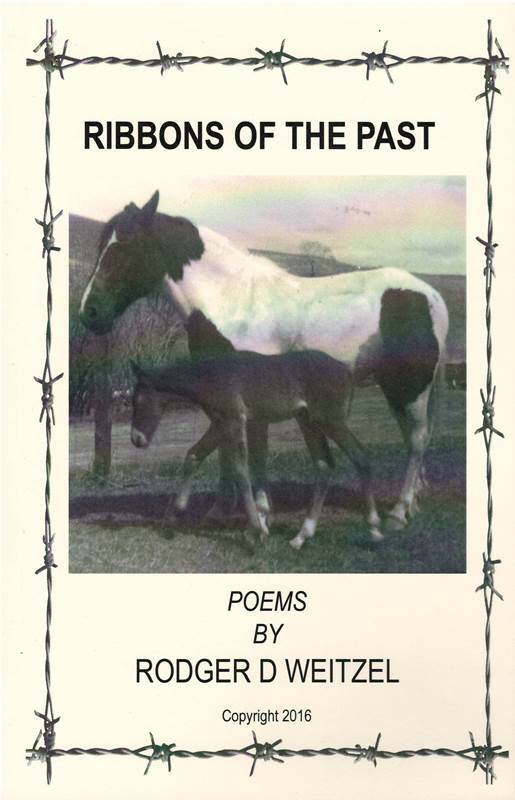 Cowboy Poetry by Rodger Weitzel at the Lander Pioneer Museum Saturday March 3, at 6:30 p.m. The Pioneer Museum in Lander kicks off its 2018 Speakers Series March 3 with a program by respected local cowboy poet and author Rodger Weitzel. Weitzel was born in Nebraska. One of a family of 8, they raised horses. He moved to Wyoming at age 16 and continued to cowboy. After serving in Vietnam, Weitzel came back to Wyoming and began writing. His new book “Ribbons of the Past” came out last year and signed copies will be available at the program. The program is part of the Wyoming Community Bank Speakers Series at the museum. The series will feature speakers and programs on the area’s culture and history at all three county museums throughout the year. The programs are free and open to the public. This program is part of the Wyoming Community Bank Discovery Speakers Series and is open and free to the public. 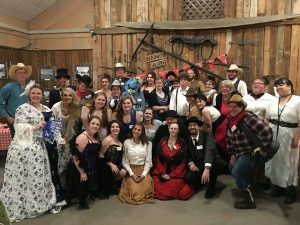 On Saturday February 10th the Riverton Museum hosted its First Annual Murder Mystery and Mayhem at the Museum event. The event’s 40 tickets were sold out almost a week prior to the event itself! The tickets included the price for a light dinner and bar that was catered by the Catering Company out of the Trailhead. Participants arrived at the museum starting at 6pm the night of the event, dressed to the nines in all manner of western wear. Folks received character packets prior to the event that held information about their characters and costume ideas. Characters ranged from Sally Starr the saloon girl to Banker Bob and his wife Banker Bonnie. Folks were encouraged to stay in character all night and many of the participants had no trouble at keeping the act going. During the course of the evening a “murder” occurred and the participants worked together to help, or hinder, the investigation. Many folks stated that they had been working out their costumes since they heard about the program weeks ago. As a whole the event was a smash hit! “We’re definitely going to try to do another event like this next year but change up the theme. We got tons of positive feedback from this event, and honestly, it was fun for us to put something like this on. We learned a lot from the experience and we’re hoping to expand upon that knowledge for next year,” said Felicity Boepple, the Riverton Museum’s Visitor Service’s Coordinator. Prizes were given out for the first person to solve the murder, Best Costume, Best Acting, and more! The staff at the Riverton Museum would like to thank everyone who participated in the event as well as everyone who helped to make this program a reality. The event was proudly sponsored in-part by First Interstate Bank out of Riverton. The first Boy Scout Troop in Riverton was founded in 1917/1918. 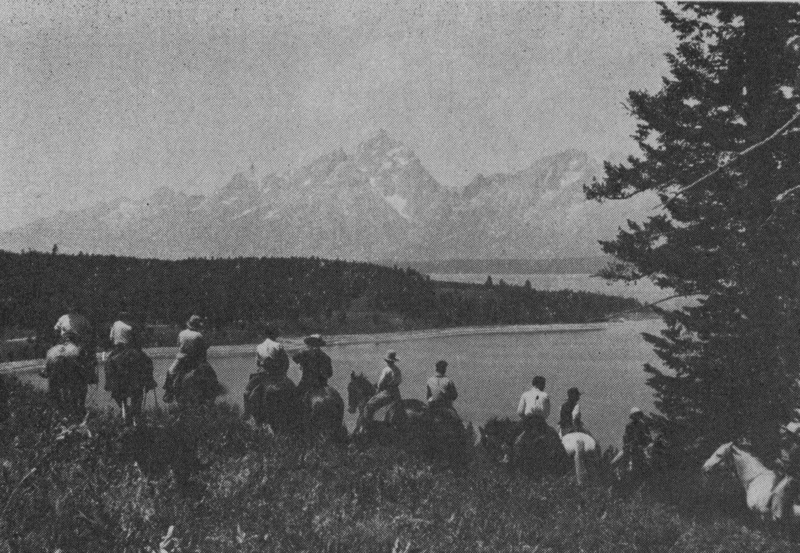 There is some dispute about which year it was founded, the Riverton Chronicle reports that the troop was started in 1918 but later editions of the Riverton Ranger reported that the first troop was started in 1917. However, both news sources agree that by late 1918 the Boy Scout Troop from Riverton was up and going strong. Some of the early members of those first troops were Franklin Sheldon, Charles Wheeler, Lawrence Hunter, Billie Warren, and many more. At this point the Boy Scouts of America was still a fairly new organization, having only been established about 10 years prior to Riverton’s First troop. Never the less, the Folks in Riverton were convinced a troop would do the younger generations good. Through their persistence a Scout Movement was founded. One of the first projects of this early Scout Troop was to play a role in the war effort in Riverton during the First World War. The Scouts would help to sell Liberty Bonds around Fremont County. The first Scout Master of record was Mr. A. L. Arnold; however, before him there was Rev. Phillips of the Baptist Church in Riverton. The Reverend was the unofficial Troop leader for the first year or so. After he became the Scout Master, A. L. Arnold helped to organize bonds that were sold to many Main Street business owners to help fund the first Boy Scout building. Many of the Scouts themselves helped to build this early building. By 1923 The Riverton troop was able to send ten Scouts to summer camp at Camp Kemp in the Big Horn Mountains located about twenty-five miles from Arminto. A year later in 1924 sixteen Scouts attended camp at Camp Carrey on Box Elder creek in Casper Wyoming. In the late 1920s, the Riverton Boy Scouts from Troop 29 would be moving to a new building that was erected under the sponsorship of the Riverton Lions’ Club. This new building was a log cabin with an upper and lower level and a large fireplace on the inside. The new building was located where the Chamber of Commerce is today. The log cabin structure was used for community events as well as the Boy Scouts meeting location. The early Boy Scouts would spend time camping on North Fork and hiking out in Milford. Later camps were on Rock Creek near Atlantic City. In 1975 the Boy Scouts hosted one of the largest Spring Camporee’s in the Wind River Campground, just north of the Boysen Dam. The troops present at this Camporee included Troop 89 of Lander, Troop 45 of Cody, Troop 45 of Worland, Troop 38 and Troop 2 of Casper, and more. The early Boy Scout Movement in Riverton proved to be a huge success, teaching boys from around the county many Scouting Skills that they could and would use even later in life. Kirsten grew up in the suburbs of Rockford, Illinois, but spent many of her summer and winter breaks in Radisson, Wisconsin, her father's rural hometown of less than 250 people. There Kirsten hiked through forests, hunted crayfish in the creek, and skated on the frozen Chippewa Flowage. Kirsten was working as an intern at the Buffalo Bill Center of the West: Cody Firearms Museum during the summer of 2017 when she fell in love with Wyoming, its history, and its people. “When I found out about the collections manager job in Dubois, I knew I had to apply because 1) it was a job in the field I went to school for and wanted to work in, and 2) it was in a region of the country that was ripe with both beautiful views and fascinating history.” In addition, Kirsten felt the job itself sounded interesting and challenging while offering opportunities for professional as well as personal growth as I go about taking care of the diverse collections the Dubois Museum holds. Kirsten holds a B.A. History from Western Illinois University an M.A Museum Studies from Western Illinois University-Quad Cities, and a Collections Care Specialty Track Certificate from International Preservation Studies Center in Mount Carroll, Illinois. Kirsten loves hiking and visiting historic places; bonus points if the two can be combined. Kirsten’s other interests include paleography (the study of old writing), learning about US railroad history, and researching the role firearms played in developing leisure culture. 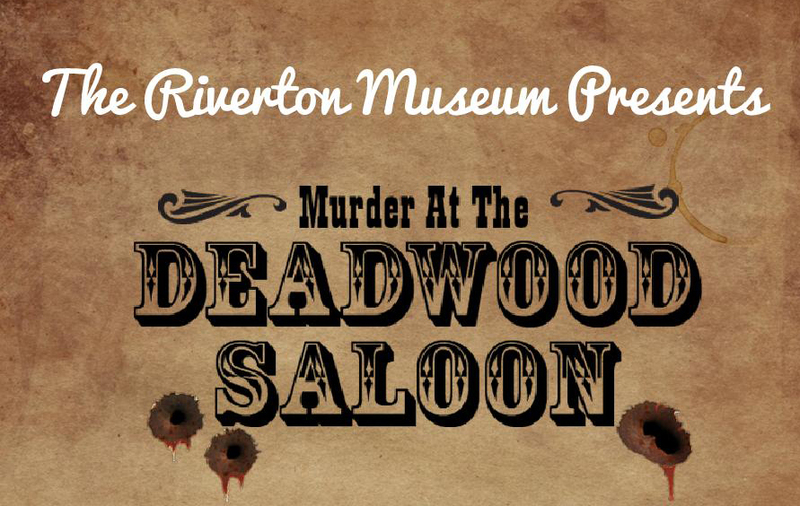 The Riverton Museum is hosting an evening of Murder & Mayhem at the Riverton Museum on February 10th at 6pm. This fun evening will feature a great mystery, "Murder at the Deadwood Saloon", food, costumes, fun, prizes and more! Participants will work together to solve a "murder" at the museum, themed around the 1840's in Deadwood! Their will be a cash bar and light dinner will be served. All proceeds for the event will help the Riveron Museums operations and programs. Costumes are not required but are encouraged. There will be a prize for the best costume! You must sign up before February 8th 2018 if you want a character packet. Tickets can be purchased for $20 from the Riverton Museum at 700 E. Park Ave or call 307-856-2665. The Pioneer Museum in Lander, WY seeks an energetic professional to manage the collections. This individual will work collaboratively with other museum staff and other museum professionals within the Fremont County Museum System. $30,000/year plus very competitive benefit package that includes excellent retirement, health insurance, 10 paid holidays per year, sick leave and vacation leave. Dubois Museum, Friends of the Dubois Museum, and Dubois Friends of the Library are once again hosting the Annual Spirit of Christmas. As always Packin’ the Mail will play true western fun dancing music, and some festive songs as well. The event will start at 7pm at the Headwaters Arts & Conference Center on Saturday, December 2nd. Donations are always appreciated at the door. It is always fun for every age group and this year Mr. & Mrs. Claus have already let us know that they will be attending and look forward to it with joy. They also hope to share the night with kids, it’s never too late to tell Santa what you want for Christmas. Desserts will be served at intermission and the winners of the gift basket raffle will be announced at this time too. The gift baskets include over $500.00 in value with various items generously donated by Dubois area businesses. Tickets can be purchased at the Dubois Museum Monday- Saturday 9am-5pm or at the High Country Christmas Extravaganza at the Headwaters Arts & Conference Center Friday, December 1st from 4-7pm at the Friends of the Library’s table. Tickets can also be purchased at the Spirit of Christmas event. The proceeds of the gift basket raffle will be split between the Friends of the Library and the Friends of the Dubois Museum support groups. Don’t forget Saturday, December 9th is our open house with free admission and discounts in the gift shop. Purchase your stocking stuffer annual passes at any of the three Fremont County Museums. For more information contact the Dubois Museum, 909 West Ramshorn, 307-455-2284 or by email at duboismuseum@gmail.com. Th e Fall issue of the Wind River Mountaineer is now available at the gift stores at the Dubois Museum, Pioneer Museum in Lander and the Riverton Museum. 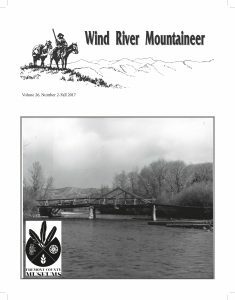 This articles in this issue are, "Outfitters, Artists and Much More: Joe & Mary Back" by Johanna Thompson from the Dubois Museum, "The Landers, an 1860's 'Power Couple'" by Randy Wise from the Pioneer Museum and "The Masonic Lodge" by Karline Stettler from the Riverton Museum. Click on the link to view the on-line version.